The Lexus RC-F May Be Slower Than The BMW M4, But Is It More Fun? An eight-cylinder argument against the segment incumbent. 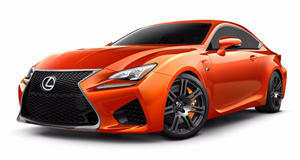 We were already a bit late to the game when Lexus sent us an RC-F for a week’s worth of testing, but Carfection takes the cake for tardy reviews because just two days before the new year, it got its hands on a copy of Lexus’ sports car (which came out in large 2014) and found it to be a bit of a dinosaur. So did we for that matter, but who's to say that dinosaurs can't be more fun pets than poodles? The reason it feels like a blast form the past is not because the RC-F is outdated. Even though its weight and resulting performance metrics do come in at the same level of the previous generation of M and AMG cars, the real reason the RC-F feels like a dinosaur is because of the naturally aspirated 5.0-liter V8 under the hood. The genius behind it is its wonderful mechanical-sounding exhaust note and an affinity with the redline. Something we should also take time to appreciate is the fact that it lags behind the LFA’s power output by only 15% while costing a fifth as much (due in part by the LFA's exorbitant cost). As much as most would like to think of the RC-F as a failed competitor to the BMW M4 and C-Class AMG, it’s really more of a luxurious grand touring machine that can dispense impressive performance only when the driver welds the throttle to the floor and thrashes the steering wheel left and right. At that point, the torque vectoring differential comes awake from its lazy rest to dispense smiles, but there's no denying that the RC-F is more comfortable soaking up stares in the city streets.